International medical travel (IMT), people crossing national borders in the pursuit of healthcare, has become a growing phenomenon. With many of the countries currently being promoted as IMT destinations located in the ‘developing’ world, IMT poses a significant challenge to popular assumptions about who provides and receives care since it inverses and diversifies presumed directionalities of care. 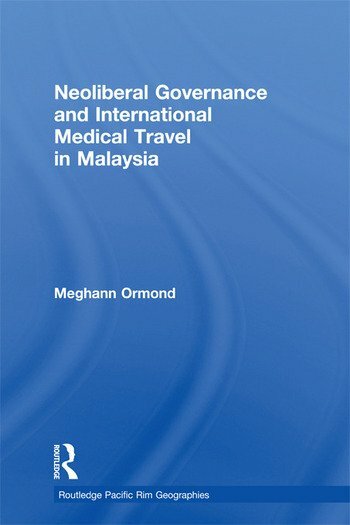 This book analyses the development of international medical travel in Malaysia, by looking at the benefits and challenges of providing health care to non-Malaysians. It challenges embedded assumptions about the sources, directions and political value of care. The author situates the Malaysian case study material at the fruitful cross-section of a range of literatures on transnational mobility, hospitality, therapeutic landscapes and medical diplomacy to examine their roles in the construction of national identity. The book thus contributes to wider debates that have emerged around the changing character of global health governance, and is of use to students and scholars of Southeast Asian Studies as well as Politics and Health and Social Care. Meghann Ormond is Assistant Professor in the Cultural Geography Department at Wageningen University, the Netherlands. She is a human geographer focusing on questions of transnational mobility, health and care in her research.